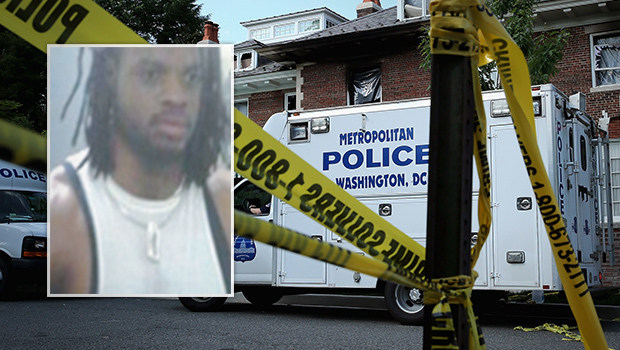 WASHINGTON -The suspect in the deaths of a wealthy D.C. family and their housekeeper was once arrested outside the business of one of the victims with a 2-foot-long machete and a BB pistol, according to court records obtained by the Associated Press. The Washington Post reports Daron Dylon Wint was arrested in 2010 after police found him sitting behind the dumpster of a gas station near the headquarters of American Iron Works, a construction-materials supplier based in Hyattsville, Md. Savvas Savopoulos, one of four people Wint is accused of killing last week, worked as CEO of the company at the time of his death and authorities have said Wint is also believed to have once worked for the company. The weapons charges against Wint were later dropped after he pleaded guilty to possessing an open container of alcohol, according to the AP. Wint, 34, was arrested Thursday night following a multistate manhunt in connection with the deaths of 46-year-old Savvas Savopoulos; his 47-year-old wife, Amy; their 10-year-old son, Philip; and the Savopoulos family's housekeeper, Veralicia Figueroa. Three of the four had been stabbed or bludgeoned before their bodies were found on May 14 in the Savopoulos family's burned D.C. mansion, not far from where the Vice President lives. Investigators tracked Wint to the Brooklyn area of New York City, where they barely missed him Wednesday night, Robert Fernandez, commander of the U.S. Marshal Service's Capital Area Regional Fugitive Task Force told the Associated Press on Friday. Officers then tracked him to a Howard Johnson Express Inn in College Park, Maryland, on Thursday night. A team realized Wint was probably in one of two vehicles in the motel parking lot: a car or a moving truck. The vehicles left together and the team followed as they took a U-turn and a strange route - seeming to be lost or trying to shake those who followed, Fernandez said. Officers eventually got between the two vehicles in northeast Washington and took Wint, two other men and three women into custody, Fernandez said. CBS News has learned the other five people taken into custody with Wint have not been charged, and they had been released as of Friday afternoon. Wint showed little emotion when being taken into custody - "He was stoic," Fernandez said. "We had overwhelming numbers and force," he added. "They completely submitted immediately." Fernandez said he noticed a big wad of cash in the moving truck, but he didn't know how much was there. CBS News, however, has learned it was more than $10,000. It was not clear whether that money might have been connected to the Savopoulos family. Fernandez said he did not know whether any weapons were found as the group was taken into custody. CBS News has learned skin cells found on a pizza crust in the Savopoulos family's home linked Wint to the crime. Someone ordered Domino's from the house the night before the bodies were found and requested that the pizza be left on the outside porch. CBS News has also learned that hours before the Savopoulos mansion went up in flames, an assistant to Savvas Savopoulos was instructed to drop off a package carrying $40,000 in cash and leave the money outside. Investigators think it's possible the family was held captive overnight and that the money delivered to the home was extorted from Savvas Savopoulos to stop the physical abuse of his family, including the torture of 10-year-old Philip. Text messages and voicemails from the Savopouloses to their confused and frightened household staff suggest something was amiss hours before the bodies were found. Their Porsche turned up in suburban Maryland hours after the slayings. It too had been set on fire. Court records indicate Wint has had numerous run-ins with the law over the years. He was arrested once in 2006 and twice in 2007 for assault in Oswego County, N.Y., Undersheriff Gene Sullivan said. He was released in July 2008 after serving a 10-month sentence, and then convicted again of assaulting a girlfriend in Maryland in 2009. In 2010, he pleaded guilty to malicious destruction of property after he allegedly threatened to kill a woman and her infant daughter, broke into her apartment, stole a television and vandalized her car. "I'm going to come over there and kill you, your daughter and friends," Wint told that woman, according to the records, which were obtained by the Associated Press. "The defendant advised he was good with a knife and could kill them easily and was not afraid of the police," a detective wrote. Robin Ficker, a defense attorney who once represented Wint, told 48 Hours' Crimesider Thursday he doesn't think Wint would "hurt a fly." "I think he's a very nice person, a gentle guy. Anyone who believes he had anything to do with killing another person is completely wrong," Ficker said. D.C. Police Chief Cathy Lanier, however, told CBS News on Friday that she is "very confident" Wint is the right person. The Savopouloses had two teenage daughters who were away at boarding school at the time of the killings. In a statement, family members thanked law enforcement, asked for privacy and said they wouldn't give interviews. "Our family, and Vera's family, have suffered unimaginable loss, and we ask for the time and space to grieve privately," the statement says. Wint is expected to appear in D.C. Superior Court on Friday afternoon.